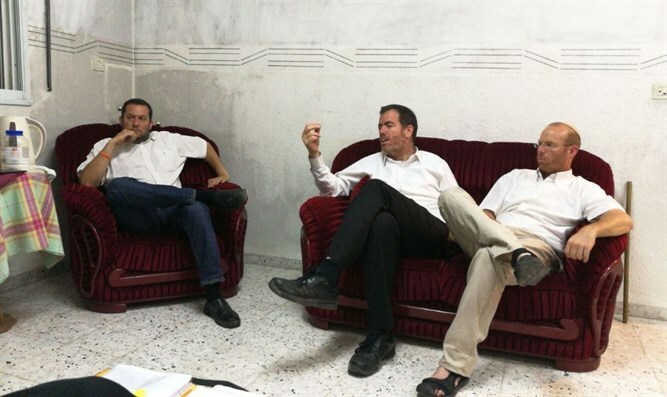 Samaria Regional Council head Yossi Dagan is on a two-day visit with his family to stay at the Tomb of the Patriarchs in Hevron at the request of Rabbi Uziyahu Sharbaf and Kiryat Arba Council head Malachi Levinger. Dagan explained his decision, "First and foremost, as head of a regional council in Israel, I see importance in expressing solidarity and mutual support in support of the struggle, and those who wish to evacuate Machpela House also want to uproot Samaria residents from their homes. "Second, it is clear to me, like the vast majority of residents in the State of Israel, that settlement in Hevron is an integral part of our Jewish roots as a people and our Zionist ethos as a nation, and that the pioneers of Hevron should be strengthened just as the pioneers of Samaria should be strengthened." Dagan added, "I turn to the Prime Minister to demand that this injustice be stopped. On the eve of Tisha B'Av, the day of the destruction of the Temple, do not lend a hand to another destruction. The values of justice must guide us in our land, to which we returned after 2000 years. In any case, this is our land, but the eviction of families from their homes, families who have purchased their homes lawfully, is a serious escalation in discrimination against residents of Judea and Samaria and the violation of their rights. Granting legitimacy to such an encroachment could legitimize injury to other residents of Samaria and the State of Israel. We expect the Prime Minister to stop this delusion." The Harchivi Mkom Ohalayich organization praised Yossi Dagan and his family's entry to Machpela House this morning: "We thank the head of the Shomron Regional Council, Yossi Dagan, for his support and willingness to take part in a Zionistic and moving process for settlement and the people of Israel as a whole. Many local families expressed their desire to come to the house, live there, identify, and take part in a great historical moment." Dagan will stay there until the end of the week with his family and will leave from there every day to serve as head of the Shomron Council.